And it hit me that since all the Nandito Ako fun lasted pretty much right up until David leaving and the release of the Forevermore CD, that I never posted the huge, huge thank you message that I meant to send out to, well, everyone in the Philippines. Not just for these amazing past few months on an NA-high but for the four solid years of David support that have kept him on the charts –and in fans’ hearts — there. For being the warm, music-loving people they are. For making David feel so welcome and inspired that he stayed extra-long to film Vangie vids, music vids, do the Bench shoot and event, and record a whole flippin’ album that we never expected to get!!!!! From the moment the Nandito Ako project was announced, TV5 referred to David as their newest “kapatid” — sibling, brother. Not just talk, either. He was welcomed like family. So were we all. Cast and crew tweeted with fans around the world. And local fans went above and beyond, not just to give David the hero’s welcome he deserves but to include all of us every step of the way. From ustreaming Team Airport the moment he arrived (with even Eula and Jasmine there at the crack of dawn!) and giving us up-to-the-minute reports (and livestreams whenever possible) on every event to the Archuleta Philippines crew doing a translation simulcast for every. single. episode. And JackRyan4DA furiously subtitling eps into English so we didn’t miss a thing. And don’t even get me started on nareejo’s photos…. But most of all, I want to send a big salamat to all those countries that play David’s amazing songs on radio, air his music videos, buy his records, sell out his concerts, and, well, “get” David. My dream is that my own country will be on that list some day. 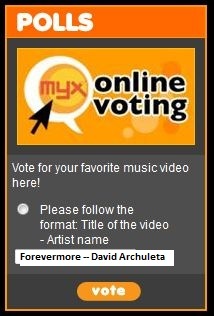 Fans, you can support David by voting for the “Forevermore” video on MYX, the top local music channel in the Philippines! 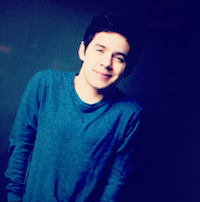 All you need to do is register on MYXph.com, log in, and type in Forevermore – David Archuleta in the MYX Online Voting Box at the upper right hand corner of the MYXph.com home page. Help make “Forevermore” the #1 music video in the Philippines! 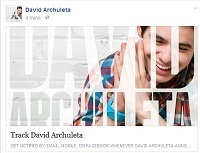 This entry was posted in Fan experience and tagged David Archuleta, Forevermore. Bookmark the permalink. correct headline translation 🙂 I echo the same thoughts. I want to Chime in with a Big Thank You to the Phillipines, TV5,Ivory, JR, Lorms, Nareejo,Kricket, Jay Durias, Percy, My Dear Writer and I know I’m forgetting some plus all the fans, interviewers, Bench, Fix etc etc. Thanks to to Snowanglez for always being postive, funny and loving for David and his worldwide fans. Filipino fans ROCK and I LOVE them!!! Thank you also Tofan for keeping up this site. 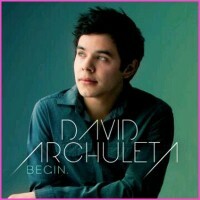 This is one of my fave David places!!! Canadian fans RAWK too!!! I agree, the Philippine fans have been amazing to all of us!!! Thank you from the bottom of my heart for everything you have done! I completely agree, TOfan!! What would we have done without our Filipino friends thru all of this?! Thanking them so much and more for all they have done. 🙂 And, I also hope, like you, that my country (the USA) will somehow catch the Archiefever like the Asian countries have. Perfectly said TOfan. I love this fan family sooo much. Our support stretches across many miles! Hugs to all! Love the shout out to our more-than-deserving Filipino friends. You guys are amazing. Watching from afar the warmth and love he received during his time there made my heart swell, as I know it did his. And all the work that went into keeping us up-to-date, making sure we didn’t miss a thing. I have to say it too, you guys rock! Salamat sa Pilipinas. Yes, very well said TOfan. Love the Filipino fans and have an abundance of gratitude towards them! They have been amazing for all they have done for the rest of David’s fans around the world and all the love they give David. A hug for each of them (and for everyone else). David has an incredibly wonderful fan base and so glad to be a part of it all. Have to give some love and gratitude for the Forevermore video too, stunning and simply beautiful! We love you, TOfan! =) And do keep voting guys. Just for a day on the chart at MYX Daily Top 10 and FOREVERMORE is now #4! Let’s make it to the top! Thank you for this wonderful post, Deb! As JR puts it, it’s our way of paying forward all the great things everyone has shared with us 🙂 We had fun sharing everything with everyone! thx. lorms!!! *cartwheels* 🙂 🙂 🙂 … now off to vote for Forevermore! LUV this…it says everything and more…that I want to say. LUVed being part of David’s NA experience and beyond. THX! Thank you all for the heart warming comments. Love it. Wish TV5 will have a sequel not on TV but a full pledge movie w/ of course Jonya team. Theirs is perfect chemistry. Maybe Derek Mac will gather his ultimate writers and be ready w/ a story to be translated in a movie. In 2 yrs time that story will be ready for DA’s return. And this movie will be shown worldwide. Kari’s job now is to contact a movie studio in california to take DA’s movie in for worldwide promo. Dream big its free, isn’t it? Am feeling good right now even its just a dream. Paging Derek and his writers. Paging TV5.